Infrastructure development projects including metros & airports, construction of new hotels & malls along with government initiatives to build world class infrastructures have led for the growth of air conditioner market in overall GCC countries. However, with the slump in oil prices, which started in mid of 2014, adversely impacted construction market in GCC countries. Overall GCC projects awards declined by 17% during 2015-16, where Saudi Arabia, Kuwait and Oman were majorly affected. The market is expected to recover post 2018, with the recovery of oil prices. According to 6Wresearch, GCC Air Conditioner Market size is projected to grow at a CAGR of 7.3% during 2017-2023. Saudi Arabia and UAE are the key revenue generating countries in the entire GCC region. Centralized air conditioner market accounted for major revenue share in the overall market in 2016, with Saudi Arabia being the largest contributor. Centralized air conditioner market is exhibited to maintain its dominance throughout the forecast period. Split air conditioner market has also captured key GCC air conditioner market share due to high demand from residential and light commercial applications. Also, VRF market is expanding in the region owing to high efficiency feature which helps to consume less energy and reduce the electricity bill. The GCC Air Conditioner Market report thoroughly covers the GCC Air Conditioner market by types, applications, and countries. The GCC Air Conditioner Market outlook report provides an unbiased and detailed analysis of the GCC Air Conditioner Market trends, opportunities/high growth areas, market drivers which would help the stakeholders to device and align their market strategies according to the current and future market dynamics. • Historical & Forecast data of the UAE Air Conditioner Market Revenues for the period 2014-2023F. • Historical & Forecast data of the UAE Air Conditioner Market Revenue, by Type for the period 2014-2023F. • Historical & Forecast data of the Saudi Arabia Air Conditioner Market Revenues for the period 2014-2023F. • Historical & Forecast data of the Saudi Arabia Air Conditioner Market Revenue, by Type for the period 2014-2023F. Application for the period 2014-2023F. 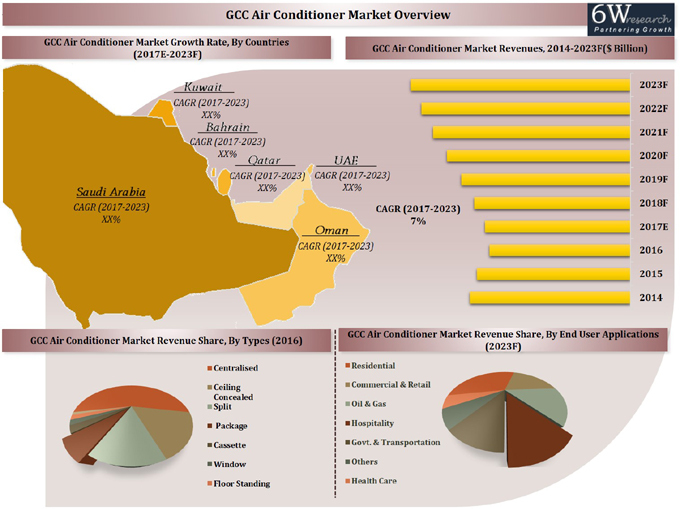 • Historical & Forecast data of the Oman Air Conditioner Market Revenues for the period 2014-2023F. • Historical & Forecast data of the Oman Air Conditioner Market Revenue, by Type for the period 2014-2023F. • Historical & Forecast data of the Bahrain Air Conditioner Market Revenues for the period 2014-2023F. • Historical & Forecast data of the Bahrain Air Conditioner Market Revenue, by Type for the period 2014-2023F. • Historical & Forecast data of the Qatar Air Conditioner Market Revenues for the period 2014-2023F. • Historical & Forecast data of the Qatar Air Conditioner Market Revenue, by Type for the period 2014-2023F. • Historical & Forecast data of the Kuwait Air Conditioner Market Revenues for the period 2014-2023F. • Historical & Forecast data of the Kuwait Air Conditioner Market Revenue, by Type for the period 2014-2023F. 17.3	GREE Electric Appliance Inc.
17.6	Samsung Electronics Co. Ltd.
17.12	Petra Engineering Industries Co.